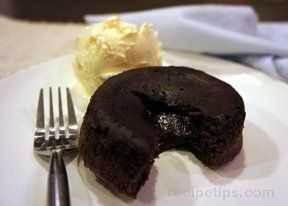 A gooey middle of warm chocolate oozing around a rich cake. It will have you wishing the little cake was bigger. Serve it with vanilla bean ice cream to top this decadent dessert off. Perfect for entertaining as it is so easy to make. Preheat oven to 350 degrees F. Grease large muffin pan or small ramekins. Melt butter and chocolate in double boiler over medium heat. 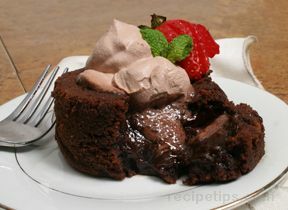 Beat eggs, sugar, salt in mixer until sugar dissolves; add to chocolate mixture until smooth. Beat in flour. Pour mixture into prepared cups. Bake until batter puffs but center is not set, 8-10 minutes. 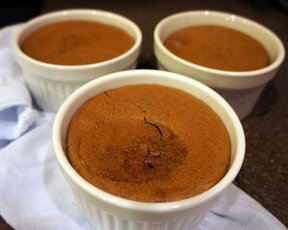 Let cool for 5 minutes, carefully lift cakes from tin and place on serving dishes. Serve with vanilla ice cream. "Wow! Made this for my birthday and it was purely heaven. I took the cakes out when there was about a nickel sized circle in the middle where the batter wasn't quite set. 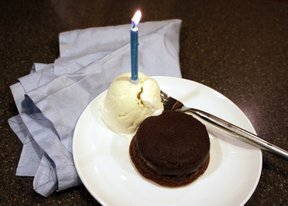 Warm cake, vanilla bean ice cream...Happy Birthday to Me!"